Each month the yards in our subdivision are judged. If the resident of the one that is considered to have the best display has not won the award within the last two years, is in good standing with the Association and agrees to accept the accolade, it is designated as the Yard-of-the-Month. A sign is placed in that yard throughout the duration of the month, a photograph and write-up are posted here on this web site and the winners are mentioned in our monthly newsletter. 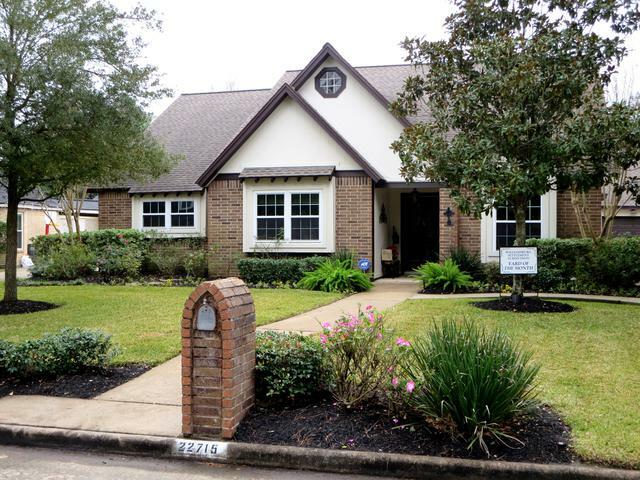 January Winner - Brian and Marcia Boggs of 22307 Vobe Ct. 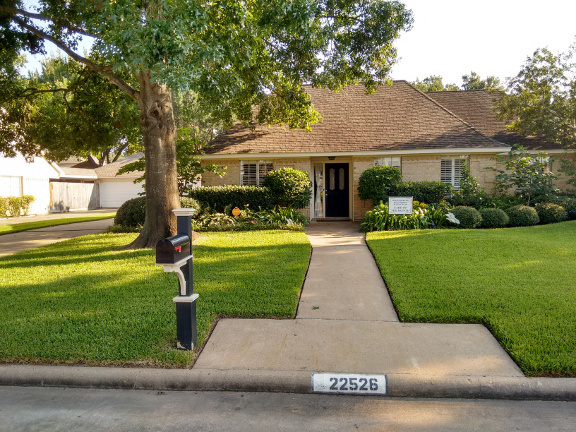 The Yard-of-The-Month for January goes to Brian and Marcia Boggs of 22307 Vobe Ct. Brian and Marcia have lived in The Settlement for the last 10 years. Their favorite things about our neighborhood are the unique homes, wonderful neighbors that look out for each other, and the pride that everyone takes in their homes. The Boggs have two adult children, Ashley and Lee. This yard is beautifully manicured. Starting at the street with purple pansies, Dusty millers and purple iris. The front curved beds are accented by neatly trimmed Japanese bushes on each corner. Those are surrounded blooming pink hydrangeas, with a row of miniature agapanthus and a row of white Encore azaleas. The side bed is full of large foxtail ferns. This beautiful home and yard has an inviting swing with pillows on the front porch. Thanks to both of you for contributing so much to the beauty of our neighborhood. 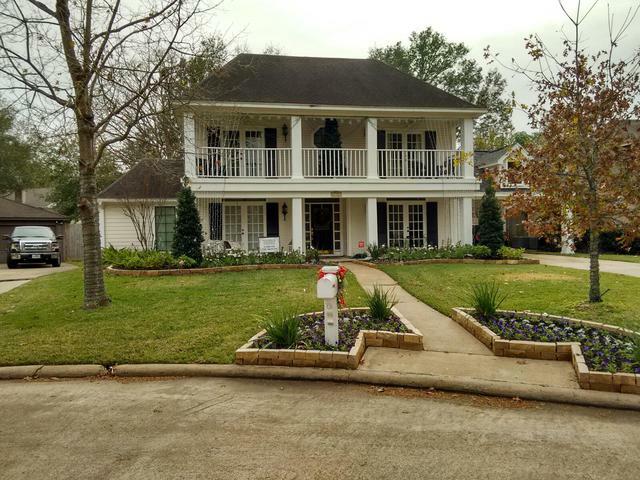 February Winner - Carolyn Keeling and Robert Robertson of 22715 Royal Arms Ct. 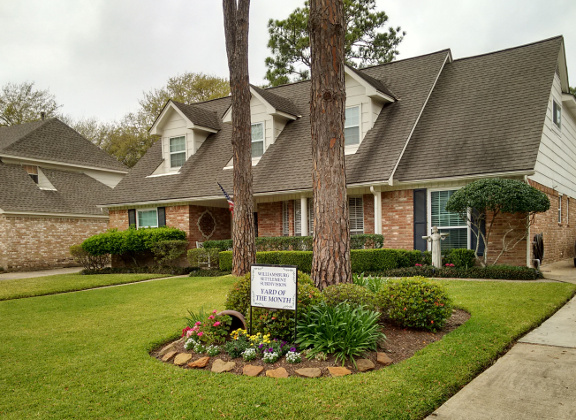 The Yard-of-the-Month for February goes to Carolyn Keeling and Robert Robertson of 22715 Royal Arms Court. The have lived in The Settlement since 2006. Carolyn and Robert have 4 adult children and 6 wonderful grandchildren. Their favorite thing about living here is the feeling of community and safety. Their yard is beautifully manicured. On both sides of the brick mailbox are Indian Hawthorns, knockout roses and iris. The winding sidewalk leads to the lovely decorated front door area. The front beds have a wide variety of plants which include variegated pittosporums, Indian hawthorns, knockout roses, foxtail ferns and more iris. Carolyn has planted pansies in both front beds. On the driveway side, they have another large foxtail fern, box woods and more knockout roses. Many thanks to Robert and Carolyn for adding so much beauty to Williamsburg Settlement. 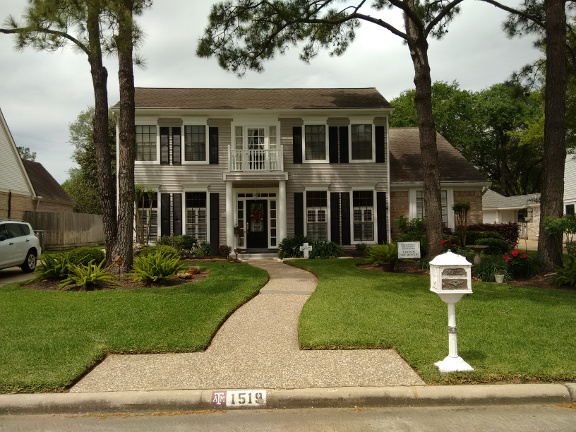 The Yard-of-the-Month for March goes to Ron and Karen Mace of 1519 Durfey. The Mace's have lived in The Settlement, since 1991 and have 2 adult children, Jason and Cameron. Ron and Karen both enjoy working in the yard, which they find soothing. Their yard is perfectly manicured. At the street the flower beds contain low junipers, society garlic and a large flowering firecracker plant. The island bed around the pine tree has Indian hawthorns, agapanthus, and red geraniums. Along the front of the home are neatly trimmed hedges of ligustrums, boxwoods, azaleas and a Savannah’s Bird Girl statue. These beds are bordered with monkey grass. At the front door Karen has welcoming decorations, including a park bench, a large glass lamp and a beautiful wreath. Thank you Ron and Karen for adding so much beauty to our neighborhood. The Yard-Of-The-Month award for April goes to Len and Barb Lockhart of 1519 Earl of Dunmore. Len and Barb have lived in Williamsburg Settlement for 2 years and love it. They have 3 adult children, 3 wonderful grandchildren and 2 more on the way. Their favorite things about living in The Settlement are that it is friendly, beautiful and such an inviting neighborhood. The Lockhart's yard is immaculate. The flower beds across the front of their home contain a wide variety of plants that include large foxtail ferns, flowering Indian Hawthorne's, agapanthus, day lilies, crepe myrtle and azaleas. There are two curved flower beds around both trees in the yard containing vinca, boxwoods, yaupons, lantanas, angel trumpet and more foxtail ferns. A flagstone pathway leads from the front walk to the driveway. Thank you Len and Barb for adding so much beauty to Williamsburg Settlement. Congratulations on winning April yard of the month. May Winner - Syd and Evelyn Poland of 22307 Prince George St. The Yard-of-the-Month award for May goes to Syd and Evelyn Poland of 22307 Prince George St. Syd and Evelyn have lived in Williamsburg Settlement since 1988. They have 2 adult children, 3 grandchildren and 3 great grandchildren. Their favorite things about living in The Settlement are that it is established, friendly and very well maintained. The Poland's yard is immaculate. There are two large pots of ferns, one on each side of the front door. The curved flower beds, along the front of the house have a wide variety of bedding plants and shrubs. These include begonias, large shaped ligustrums on each corner, knockout roses, boxwoods, bottlebrush, Indian hawthorn, photenias, nanadinas and lantanas. The driveway side has bright red canons that are in bloom. Several large rocks accent the front beds which are topped off with a brick border. Thank you Syd and Evelyn for adding so much beauty to Williamsburg Settlement. Congratulations on winning yard of the month. 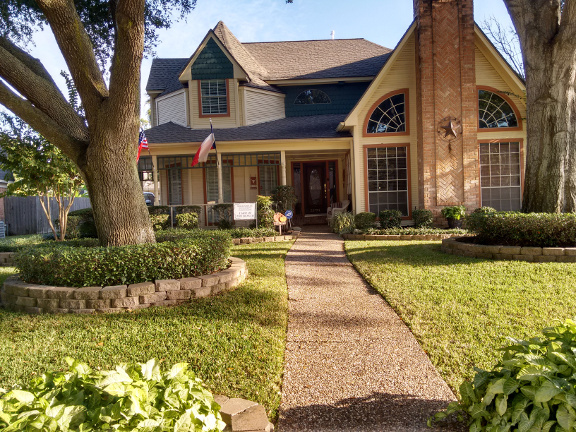 The Yard-Of-The-Month award for June goes to Kim and Daphne Jones of 22531 Unicorns Horn. Kim and Daphne are long-time resident of The Settlement. They have lived here since 1980 and have 2 adult children. Their favorite things about living in The Settlement are their neighbors, the location, and easy access to restaurants and shopping. The Jones's yard is beautifully manicured. There are two large pots of ferns, one on each side of the front door. The curved flower beds along the front of the house have a wide variety of bedding plants, shrubs, azaleas, crepe myrtle and lantanas. They also have a large island bed around one of the trees containing large asparagus ferns, variegated ginger, sellum, plumbago and Aztec grass. Around the other tree is a large bed of purple agapanthus. Flat rocks surround all the front beds. The carport/driveway side has a long brick planter filled with ferns. Thank you Kim and Daphne for adding so much beauty to Williamsburg Settlement. Congratulations on winning yard of the month. 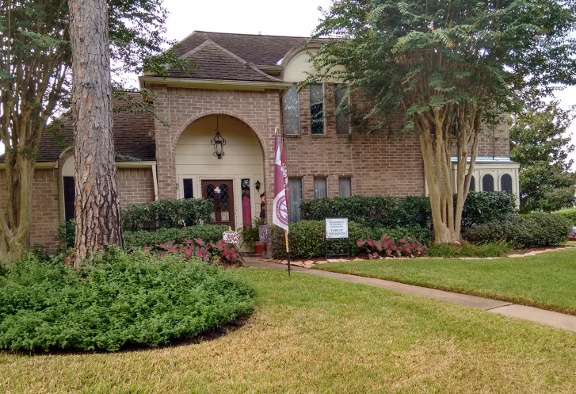 The Yard-of-the-Month award for July goes to Carlos and Leslie Chavez of 22014 Joshua Kendell. Carlos and Leslie have lived in The Settlement for about a year. The Chavez's have 2 high school age sons, Jonathan and Joseph. They love The Settlement because of its location, beauty and safety. The front of the Chavez's home has been totally remodeled. 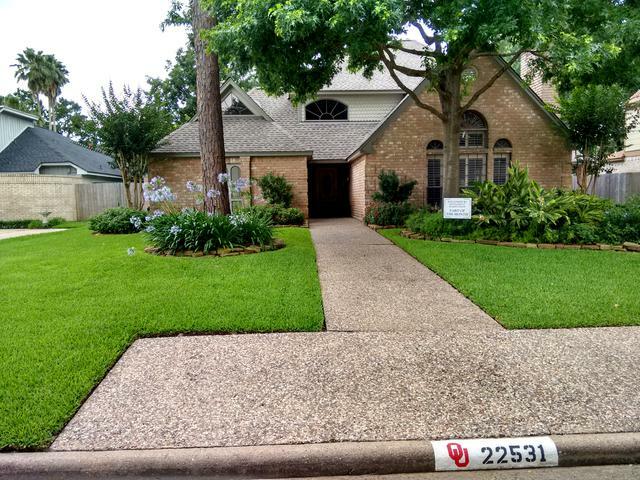 This lovely yard is beautifully landscaped. The front flower beds have variegated ligustrums, azaleas, gardenias, plumbagos, oleanders and are outlined with monkey grass. Around the trees and in the front beds are large multicolored begonias in bloom. The front beds and trees also have a stone border and there are stepping stones leading to the driveway. 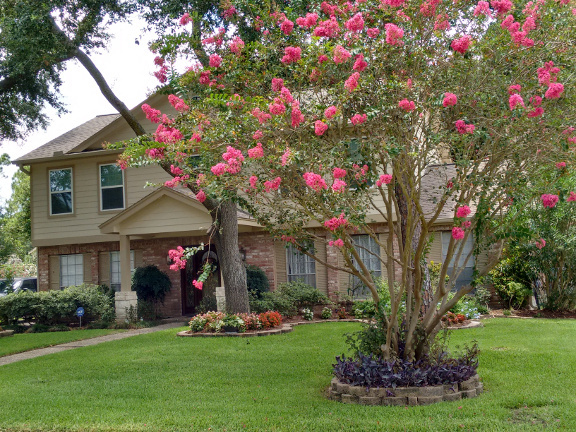 The flower bed on the driveway side has sago palms and crepe myrtles. Thank you Carlos and Leslie for your hard work and adding so much beauty to Williamsburg Settlement. Congratulations on winning yard of the month. The Yard-of-The Month award for August goes to Ervin Hester and Nellie Kress of 22418 Vobe Ct. Ervin and Nellie have lived in Williamsburg Settlement since 1990 and now have 2 adult sons and 3 grandchildren. The thing they like most about the Settlement is that the homes and yards are well cared for. Their yard is beautiful. Around the mailbox are 2 neatly trimmed and intertwined Jasmine vines. The beds around each of the 3 pine trees are filled with pink society garlic. The front flower beds, which are outlined with liriope, have a row of Indian hawthorns, bright red caladiums and large crepe myrtles on each corner in honor of their parents. They also have a row of knockout roses along the driveway and side of their home. The porch, along the front is decorated with a large Uncle Sam, a wooden wagon and 3 hanging ferns. By the front door is an inviting wrought iron bench and, as Ervin plays the trumpet, next to the house they have a trumpet player sculpture. Thank you Ervin and Nellie for adding so much beauty to our neighborhood. 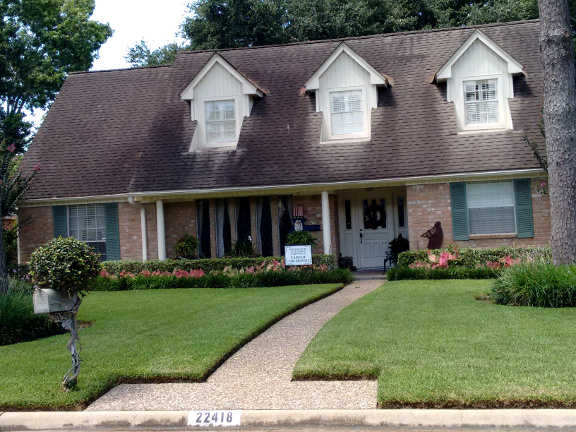 The Yard-of-The Month award for September goes to Matthew and Yolanda Dunleavy of 22526 Prince George. Matthew and Yolanda have lived in Williamsburg Settlement for 3-1/2 years. They have 1 adult child. They love The Settlement because the homes are not cookie cutter homes; all have mature trees and the location is great. The Dunleavy's yard is beautiful. The front flower beds have a wide variety of plants. There is a large group of agapanthus on each side of the front walkway. In the front beds they also have holly bushes, Indian hawthorns, mance, redbud, boxwoods, ferns, esparanza, hibiscus, caladiums and a large yaupon on the corner. Along the driveway side of their home is a large plumbago in full bloom. Their back yard is a tropical paradise with beautiful lighting and trellis's that Matthew built. Thank you Matthew and Yolanda for adding so much beauty to our neighborhood. The Yard-of-The Month award for October goes to J and Marla Doehring of 22631 Bucktrout. J and Marla have lived in Williamsburg Settlement since 1989. They have 2 adult children, Jamison and Sarah. The Settlement gives them a feeling of community and a family environment. The Doehring's yard is very colorful. The front flower beds have a wide variety of plants. They have large photenias, Indian hawthorns, crepe myrtles, large red leaf caladiums and flagstone outlines the front beds. The large corner island plant bed has boxwoods, hibiscus, purple fountain grass, geraniums, knockout roses and society garlic, in bloom. Thank you J and Marla for adding so much color and beauty to our neighborhood. November Winner - Dave and Jan Henson of 22706 Royal Arms Ct. The Yard-of-The Month award for November goes to Dave and Jan Henson of 22706 Royal Arms Ct. Dave and Jan have lived in Williamsburg Settlement for 21 years. They have 2 adult children and their first grandchild is on the way. They love living in The Settlement because of the quiet and convenient location and ease of access to the freeway. The Henson's yard is immaculate. The front flower beds have a wide variety of plants. Large nandinas are on each side of the front walk along with variegated spider plants. Other plants that are in the front beds are holly bushes, Indian hawthorns, boxwoods and crepe myrtles on the corners. The front beds are outlined with monkey grass and these and the trees are bordered with attractive stone. The wrap around porch has an inviting swing to enjoy the beauty of this yard. Thanks to Dave and Jan for contributing so much beauty to our neighborhood.